This is another book I picked up just-like-that. I had not heard about it nor had any body recommended it to me. I saw a list of books nominated for the International IMPAC Dublin Literary Award in the library and this book was one of the books in the list and the name and the synopsis looked interesting to me. 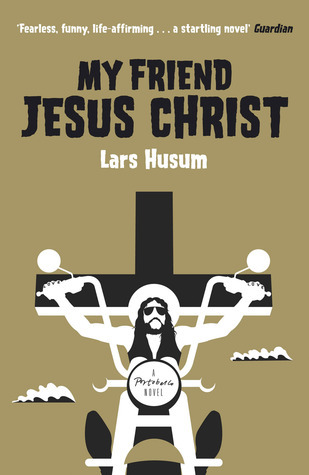 This book is the debut novel of the Danish author, Lars Husum. It was originally published in Danish and has been translated in English by Mette Peterson. Although the name Jesus appears in the title, let me clarify this bit at the outset, this book is not a religious one and it doesn't preach Christianity in any way. The book is all about Nikolaz or Niko, as he known among his friends and family and his screwed up life. It is about how he apparently sorts out his life and finds he way to redemption with the help of a character who calls himself Jesus. Niko has a mentally troubled life ever since his parents died in a tragic car accident. At the beginning of the novel, I felt he might be suffering from some sort of intellectual disability, but as the novel progressed I realized that was not the case. The shock of being orphaned at the age of 13 was too much for Niko to cope up with and due to that he suffered from great anguish and a terrible pain in the form of a stomach knot. He became far too possessive of his sister and craved for her attention. That ultimately did no good to any of them. Jesus enters in the story when Niko is passing through the worst phase of his life having lost his love, friends and family and he guides him to make a fresh start and sort out all his tangled relationships. The story centers solely around Niko and all other characters centers around him. The language of the book is simple and straight and holds up the readers attention fairly well from the beginning. Niko is portrayed as a soul in agony right from the beginning. What I couldn't digest was the fact, how a person of Niko's fame would just listen to a stranger who calls himself Jesus and take life changing decisions! Even if you set that aside, the ending of the novel actually comes as a surprise. In fact, the last few pages disappointed and confused me. Almost 2/3rd of the novel is about how Niko tries to sort out his life and in the last few paragraph, the author gives you a jolt. It is not clear if he has finally made truce with his past or if will go back into his former life of anguish and self destruction. As a reader I was flabbergasted and it marred all the good moments I had with the novel. I would have given it a 3 on 5 rating, but because of the way it ended I give it a 2 rating. This is a book that I would say you could give a miss. There are true widows and elderly who require financial assistance or emotional support through a specially built home or shelter for those who are homeless. A lot of funds are needed to build the right type of home to cater to these communities which the become ordained online undertakes.